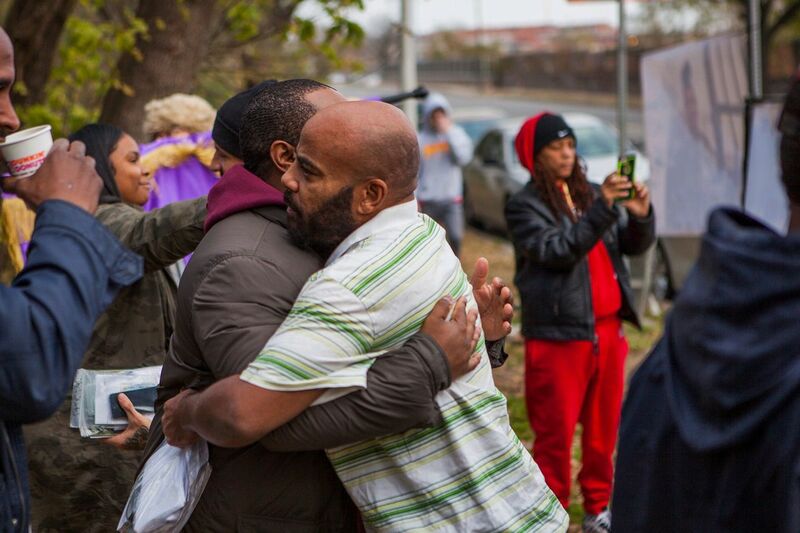 Supporters and recently released individuals embrace during a November 2018 Philadelphia Community Bail Fund bail-out. Last fall, the Pennsylvania ACLU sent a warning letter to Philadelphia court administrators, claiming the current practices around setting bail — often well outside court guidelines, and rarely with any consideration of a defendant’s ability to pay — are unconstitutional. On Tuesday, the organization announced it has filed a class-action complaint in state Supreme Court, urging the justices to compel Philadelphia to follow the court’s own rules on bail. “The system of bail in Philadelphia is clearly quite broken,” said Reggie Shuford, executive director of the ACLU of Pennsylvania. “The rules say there’s a presumption of pretrial release, and, before you can give someone cash bail, you have to evaluate their ability to pay,” said Mary Catherine Roper, deputy legal director of the ACLU of Pennsylvania. The lawsuit was filed on behalf of a group of 10 currently jailed defendants, along with the Philadelphia Community Bail Fund, which has raised more than $300,000 to post bail for 109 defendants since it started two years ago, and the Youth Art & Self-Empowerment Project (YASP), which works with youth charged as adults. Reggie Shuford of the ACLU of Pennsylvania announces a lawsuit to compel bail reform in Philadelphia. He's with Josh Glenn, of the Youth Art & Self-Empowerment Project, and Candice McKinley, of the Philadelphia Community Bail Fund. Both organizations are plaintiffs in the lawsuit. In Philadelphia, court magistrates oversee arraignments and assign bail in hearings held 24 hours a day, in rapid-fire sessions, in a hearing room in the basement of the Criminal Justice Center; defendants are linked in by video feeds from holding cells around the city. There is a public defender in the room, but often that attorney can be heard warning the defendants not to speak at all, because anything they say could be used in their prosecution. Josh Glenn, who helped found YASP while he was incarcerated in a Philadelphia jail on $20,000 bail — he sat there for 18 months before his case was dismissed — barely remembers his bail hearing. Many young people the organization works with are assigned bail in the hundreds of thousands of dollars. Glenn said he’s supporting the lawsuit to shed light on their plight and so that what happened to him won’t keep repeating. Roper noted that the law does provide an avenue for keeping a defendant locked up pretrial, if the court deems it unsafe to release him or her. “But it requires real due process,” she said. A study of Philadelphia courts by legal scholar Megan Stevenson found that bail resulted in the disproportionate detention of poor and African American defendants. She also found those incarcerated pretrial were 13 percent more likely to be convicted than those who were released, and served sentences that were, on average, 42 percent longer. Candice McKinley, an organizer with the Bail Fund, said she has seen firsthand the impact of money bail on individuals, who have lost homes, jobs, and much more while incarcerated for inability to pay. One woman, she said, gave birth while incarcerated; the bailout enabled her to go to Family Court and fight to get her child back. Reuben Jones, a Bail Fund organizer, said advocates want to work with the court to reform that process. Legal action is a last resort.